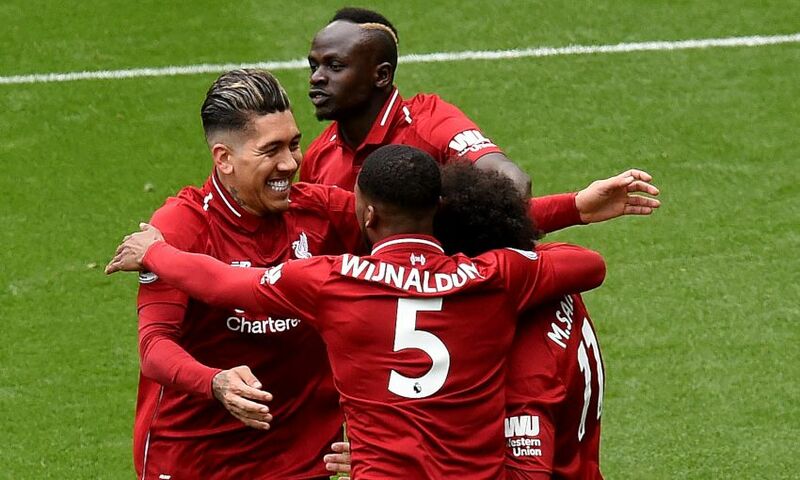 Liverpool narrowed the gap at the top of the Premier League table to one point by beating Burnley 4-2 at Anfield on Sunday. The Reds fell behind after six minutes of play when Ashley Westwood’s corner from the left flew straight in, though Alisson Becker felt he was unfairly impeded by James Tarkowski. Roberto Firmino equalised on 19 minutes, however, with Tom Heaton and Tarkowski failing to deal with a Mohamed Salah cross, allowing the Brazilian to tap in from close range. Soon after, Sadio Mane fired the hosts into the lead when he rasped a loose ball into the corner with aplomb after Salah had been challenged by Charlie Taylor. Firmino slotted in a third in the 67th minute, but Burnley reduced the arrears in stoppage-time through substitute Johann Berg Gudmundsson. Nevertheless, Mane slotted in Liverpool’s fourth soon after, ensuring they reduced the points deficit at the summit with eight games left to play. Liverpool made two changes as Adam Lallana and Firmino came in for Jordan Henderson and Divock Origi. Dejan Lovren was named among the substitutes after returning to fitness. With Manchester City having moved four points in front at the top by virtue of a 3-1 win over Watford on Saturday evening, Liverpool kicked off aiming to close the gap on their fellow title challengers. However, just six minutes had elapsed when Burnley stunned Anfield by taking the lead, with Westwood’s corner sailing straight in from the left. Alisson and his teammates were left furious by the decision to allow the goal to stand, with the goalkeeper feeling he’d been prevented from jumping by Tarkowski. He received a booking for his protestations. Liverpool’s response saw Firmino have an effort deflected narrowly over before Mane guided a header off target from Trent Alexander-Arnold’s centre. But the Reds did draw level in the 19th minute. Salah and Georginio Wijnaldum opened up their opponents with a one-two that sent the former speeding towards the touchline. Heaton and Tarkowski got in each other’s way as they tried to deal with the delivery, allowing Firmino to tap in. Jürgen Klopp’s side then took the lead as Mane notched for a sixth successive home league game. It owed much to Lallana’s outstanding charging down of Phil Bardsley’s attempted clearance, with the ball breaking initially for Salah and then Mane, who netted unerringly to send his team in ahead at the break. Liverpool set about looking to make certain of maximum points in the opening exchanges of the second period, with Salah clipping over the bar and Firmino seeing a cross-turned-shot evade the bottom corner by inches. Just after the hour, Mane and Wijnaldum both attempted to reach an Andy Robertson delivery unsuccessfully as Burnley began to mount some sustained pressure; however, their spirts were dashed in the 67th minute. Heaton’s goal-kick only succeeded in finding Salah, who strode through on goal but was challenged by the recovering Taylor. Nevertheless, Firmino was on hand to nudge home. With just under 15 minutes remaining, Lallana was withdrawn to a standing ovation after an outstanding performance. Naby Keita was his replacement, with Henderson having earlier taken the place of Wijnaldum. The captain went close to adding goal number four, seeing a drive from an angle clatter against the challenge of Ben Mee on the edge of the six-yard box, before Mane touched Alexander-Arnold’s cross against the crossbar on the slide. Salah was then thwarted by a flying one-handed save from Heaton, but Gudmundsson gave cause for concern when he stabbed in Burnley’s second in stoppage-time. There was still time for Mane to round Heaton and roll in the Reds’ fourth, though, to make sure they successfully closed the gap on City at the summit.